While taking a shower yesterday, a thought struck me. Could I claim a tax deduction for those long hot showers? After all, they are like medicine to me, practically a treatment procedure for my RA. I go in stiff and come out pliant. I once read this man takes two hot showers a day for his RA. I only take one a day, though two would be nice. But, would that be a tax break on my water bill or my electricity bill, or both? Will just asking the question get me into hot water with the tax man? And I don’t take those showers just for my RA. I do my best thinking in there. I go in cold and come out with all these story ideas, poetry outlines and passages. So could I lump them in with the home office deduction for my writing business? Time, as they say, is money. And I spend a long time in those hot showers, a long time. The hot water feels so good, like liquid silk on my skin. I can practically see my joints loosening up, especially my hands. My hands are the most susceptible part of me to the RA related stiffness that sets in. The saying that idle hands are the devil’s workshop cannot possibly apply to me. Anymore. For idle hands become painful hands for me. I like to keep them busy while I am awake. And what they mostly do, besides dreary housework and even drearier bill paying, is writing. This brings me back to my original question, a tax deduction for my long hot showers. Why not? They are multi-purpose. They foster physical well-being and creativity. They are soothing and relaxing. I wonder if I can get the doctor to write me a prescription for hydrotherapy. It’s a thought. 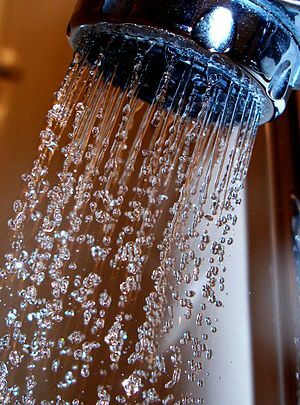 The only thing that would make my long hot showers even more beneficial would be having someone to share them with. There’s a lot to be said for closeness and companionship to ease the pain of RA. Besides, it would also help out the environment, conserving water and all. Talk about compliant. But, would he be my tax deduction or would I be his? Would that be one deduction, two deductions, three? Things that make you go hmmmm? Guess I’ll go take a long hot shower and think about that one. This entry was posted in Humor, Therapy and tagged Business, companionship, environment, humor, Hydrotherapy, poetry, prose, relationships, Shower, Skin, water conservation, Water heating on August 1, 2011 by Irma. I will not let you have me! This entry was posted in Resilience and tagged Arthritis, communication, community, Conditions and Diseases, Coping strategies, expression, feedback, Health, Musculoskeletal Disorders, pain, poetry, relationships, sharing, teaching, touch, Treatment, writing on July 25, 2011 by Irma.